Atlantic Fleet has just been submitted to Steam’s Greenlight process. If you’d like to see the game available on PC and Mac, swing by the link above, vote for it, post comments and let others know it is there. Once Atlantic Fleet gathers enough votes, it’ll be approved and we’ll then be able to release the game through Steam. What’s new in the PC/Mac version? Mostly some graphical improvements, full music scores and enhancements to the user interface at this stage. So the Computer players won’t be getting any more ships or planes then we already have? Not sure at this time. We’ll see how things go. Are you referring to the Great Lakes on the map image? Thanks we’ll get that fixed. If I already bought Atlantic Fleet for my mobile phone (s3 mini) and I now want to buy it on Steam… Do I need to buy it again or am I able to say “I already bought it, I just want it now for PC too.”? You need to buy it for PC again, because Steam is a different service from Google Play. Install bluestacks on your windows pc, connect it with your google play account and you’ve got AF on a pc. Will we ever get Japanese Subs from the Yangai Missions? From the SimHQ review, it said that their next game will be realtime, not this one. Wiso kommen mache Schiffe im battle of the atlantic immer wieder habe die scharhenhorst und andere schon 3 mal versenkt ??? I really hope they do World War One for their next game. If they do that, I hope we have Russian,French,British( and possibly the first carrier),and Japanese ships. And for the Central Powers I hope we have German ships,Turkish shps,and Austrian ships. Also, the Battle of Jutland should be a historical battle. P.S could you have an option for the game if you want the game to be realtime or not? Good news. I’ve voted now, I would love to see the game on computer. I am content with the turn base even on computer. Being able to see Atlantic Fleet on something as large as an monitor screen, being able to press my print screen button to take an screenshot, and having keyboard controls, means I would indeed purchase the game. Having the Steam Community Hub would be cool too to discuss with each other our various fleets, tactics, share screenshots and such too. That said would be great for it to have an little more depth. For example more sectors. More actions for the player to do on the Battle of the Atlantic map. Some more ship classes would be nice although nothing unhistorical that didn’t see men serving their countries upon, more features rather than ships are what is needed in my opinion. Killerfish Games, someone on the Atlantic Fleet subreddit is saying that he can’t sink British submarines with German depth charges, but sunk U-boats with British depth charges. Can you test if the British subs in the game, if they are vulnerable to the German depth charges? This was a bug that was fixed with version 1.09. BBs are currently way to powerful. Please make all guns over 10″ fire every two turns. Also add whole salvo shell drift parallel to the targets movement and based on its speed similar to torpedo drift in Pacific Fleet. Very good point. But for simplicity we’ve reduced the combat to one move and one action per turn. Yeah that’s why I was saying you could limit them to every two turns. Who cares if BBs are too powerful? Isn’t that kinda the entire point of having one? How about for minesweeping operations? Minesweeping would be a good idea, but we still don’t have the ships to do that. There shouldn’t be a 100% chance that a ship will hit a mine, when it is an area laid with mines. During battle, mines should be seen. Mines laid by the enemy shouldn’t be visible in the BoTA map. The locations of your own mines are visible. Occasionally, when a battle starts or during a battle, instead of the usual option of “none” in the movement phase as the usual command, the game will have “smoke” (or “surface” or “dive” in a submarine) as the first option, forcing the player to manually select “none” so they can fire. All ships seem to be able to lose their crews. There are no spotters, AA gunners, or miscellaneous personal visible on them. This occurs after a few custom battles are played with these ships consecutively. For example, playing with a North Carolina class battleship vs a Scharnhorst class battleship several times in a row in custom battle will cause the crew to disappear. King George V, Lion, North Carolina, York, Renown, and Leipzig class ships do not show damage effects visible below the waterline on iPod 5. Courageous class carriers can launch Swordfish instead of Barracudas in custom battle. Generally, the first strike they launch is Barracudas. Once they launch a second wave, the planes sent are Swordfish. Sunderland bombers seem to be missing their defensive armament in their turrets. In the tactical map, the splash history for the new U-boats (XXI class) indicates that it has a 4.1 inch gun. Are German surface torpedoes suppose to have a range of 15,000 yards? The manual says they should travel 8,750 yards. Excellent reports. We’ll look into them. Ships losing crews: does this only happen if the ship is sunk? Damage underwater: is this verified as working on devices other than the iPod5? KM Torpedoes should have range of 8750. Looks like a bug. Only issue with crew we found is that they disappear when the damaged model for a ship appears (now fixed for next update). Have you seen no crews on an undamaged ship? Do you ever see no crew at the start of a battle? For the No damage below waterline: does turning on simple underwater effects option resolve this? I think I narrowed it down. If you play the same ships multiple times in a row under the same conditions (For example, say I play Hood vs Lutzow, AI off, noon, sunny, no aircraft, playing as Hood). For the first battle, the crews will show up. If you scuttle Hood, sink Lutzow, or have Hood get sunk, then the ship that got sunk will not have their crew appear the next time you play. You have to play the battle under the same conditions to see this. So if I sink Lutzow and play again as the Hood, Lutzow will not have her crew in the second engagement at the start of the battle. Adding additional ships to both sides in the second engagement seems to fix this issue. Pls add H-44 as a bonus in the steam version. I made my own Tumblr blog. 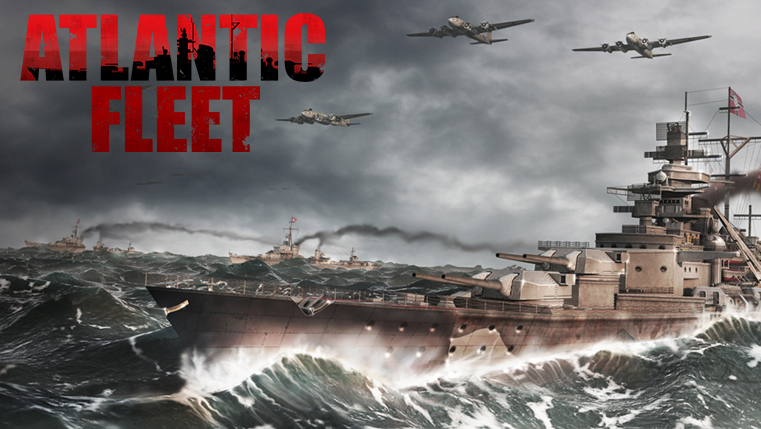 One of its focuses will be on Atlantic Fleet, and the next game to be made by Killerfish, after Atlantic Fleet. Note that not all of it is about Atlantic Fleet. Looking for critique. Any suggestions? I have added comments support. Anyone want to test my blog’s comment system? You must log in with your Disqus account, Facebook, account, Twitter account, or Google account. Killerfish Games, in Battle Fleet 2, I noticed that it’s possible to speed up the game. Could you have an option to fast forward the gameplay of Atlantic Fleet, so you could wait for a shorter time for the enemy’s turn to finish? Interesting idea and might be possible. Killerfish Games, do you think it would be a good idea to have an option to send reconnaissance aircraft to a certain location? There should be a limited amount of recon sorties per turn. If enemy ships are spotted on the map by reconnaissance aircraft, their location will be visible for 2-3 turns. Great idea! Like if a group has a capital ship equipped with 3 planes, the group should be able to scout 3 adjacent locations (subject to a total maximum allowed per turn, say 5 scouts total per turn). To balance out on the axis side due to lack of capital ships, maybe a radio transmission from HQ that’s charged every 5 turns. When requested by a battle group, reveals all the allied ships in all adjacent locations. Excellent idea. In conjunction with Merchant Aircraft Carriers and catapults on merchants could add a lot of strategic options. Also the ability for capital ships to launch scout planes to increase gunnery accuracy due to spotting splashes. We’re working on the PC version and getting the 1.10 and Lite versions out right now. Not sure if/when we’ll get back to adding new core features to Atlantic Fleet. I know your still working on Atlantic fleet but is there any chance that in the future we could get a Cold war themed game? The modernized Iowa with Tomahawks, Phalanx CIWS, and Harpoons, and Kirov will be able to fight each other in a mobile game for the first time, if that was made. How would the dynamic campaign work in a Cold War game? Would it be all out war between the US, its allies, against the Soviets, Chinese, and other communist nations? Also, some ships will have guided missiles. You would have to be able to select the coordinates on the map for guided missiles. We could even have land bombardments again. One would be New Jersey in Vietnam, and Missouri and Wisconsin during Desert Storm. The carrier wings will obviously be larger, because of supercarriers. For example, in a dynamic campaign, there could be a naval encounter between the US and Soviet Union. You could make a decision to turn away from the opponents’ territory, or attack the opposing force, which risks the campaign escalating into an all-out war. Or a game based off of the naval aspect of Tom Clancy’s “Red Storm Rising.” That would be awesome. Off topic, but I just read on the news that a USMC F/A-18 pilot died in a crash in Cambridgeshire, UK today. I offer my condolences. Could you display the exact locations of all merchant ships, and their number in each location? When I click the merchant ship button, I don’t see any merchants near Sputh America, yet U-boats are sinking merchants there. The merchant ship button shows convoy routes. These are the paths taken by convoys and the darker the blue, the higher the frequency of convoys moving through that zone. Merchant ships also travel independently of the convoy system, these are the ones you’re seeing get attacked near South America. Events attacking convoys yield more tonnage sunk than events involving non-convoy merchants. Hey Killerfish, I was wondering if you could actually launch aircraft from the BBs. I like how they implement that in world of warships. 1: Have the AI follow the historical order of battle in historical battles like when in the Battle of Denamrk Strait, when I play as Germany, Prince of Wales and Hood will for on the Prinz Euguen, not the Bismarck and the Hood will turn when historically it didn’t turn until it had been badly damaged. Nuclear moose, I’m available to play GS3 Korea right now, hard mode. Hard mode room will be up in one minute. Hey, why’d you leave gm? Some screenshots from that match were also uploaded to my blog. Hey Killerfish, where are the signs of unused carrier aircraft intercepting enemy planes? I read in the manual that unused carrier aircraft attack attacking aircraft so what are the signs of them attacking? Sorry if that sounded redundant. Enemy aircraft will be shot down immediately and you get the message “enemy plane shot down by carrier aircraft”. We’ve thought about something like this. But it is a double edged sword; it makes the carriers invulnerable as they are out of range of all enemy units. Killerfish Games, what about launching your fighters from carriers for an air defense role, aside from doing airstrikes? If the enemy launches an airstrike against you, one of your airborne fighters will try to intercept it. Ignore this now. Seems to already be in the game, according to the dev, because enemy aircraft will be shot down immediately by carrier aircraft. This is a bug in 1.09 version. It is fixed in the next update. In final testing. Hopefully should be this week. You also forgot USS Laffey, an Allen M Sumner class destroyer. Served during D-Day, later survived a kamikaze attack by 50 Japanese planes. You would need shore bombardments, and the devs said it’s unlikely that shore bombardments will be in this game. There could be a message saying in BOTA that Operation Overlord has begun though, if you reach June 1944 in the campaign mode. You forgot the heavy cruiser ‘Wichita’, a member of PQ-17’s screen. do we need any of those though? The Royal Navy was the primary navy during the Battle of the Atlantic. We don’t need more US ships. It’s better to make the RN have the bulk of Allied ships in the game. Those older battleships would be a waste of time. North Carolina is better than them. Ranger is also worse than Illustrious, so it would also be a waste of time to add. Compare this to 4 German BBs…. I only want South Dakota, Iowa under the condition of being unlocked, Allen M Sumner, and either Somers or Gleaves. I don’t want the USN to exceed the number of RN ships. And all these ships would take up more space. It also takes a lot of work to add that many ships. A capital ship takes 2 weeks to model. And what do you mean by “All classes”?,Do you mean all British and American ships that served in the Atlantic?,because if so,The Devs would have to spend Large amounts of time developing them,And they’re already working on a new game which is already taking up time,why waste time and resources on pointless ships? And this isn’t World of Warships. You’re expecting too much from indie game developers. If you want all those ships in a short amount of time, go play WoWS. It will cost a lot of money to put them all. Not only that, research about their service in the Atlantic needs to be done. When I suggested France and Italy, I had found that it would take a long time to add them (probably a year). I think they should add the USS Alabama. Well the US classes are going to be made for the Pacific Version so why would it be a waste of money? You don’t get South Dakota for free, even if you model New Mexico and Colorado. They’re completely different ships. Sorry I meant Tenessee, its New Mex turrets on a Colorado hull. They might not have the resources to develop a new game, and add a bunch of new ships to Atlantic Fleet at the same time. Also, even if you put Iowa, you still have to rework the model. Its current model in Pacific Fleet doesn’t live up to Atlantic Fleet’s standards. We don’t know for sure if they are going back to the Pacific, because they have not specified the setting for the next game. If that content is exclusive to PC, it will be unfair for mobile players who can’t afford to buy a PC. When did they ever say they were making a new pacific fleet game? Admiral Hipper (x4), Z.1 Leberecht Maas, Large freighter (8700t variant) with 10x Stuka. I was German and the AI was British. Having launched her aircraft, Courageous then, instead of attacking me she moved and the message at the bottom simply read ‘Courageous : ‘. It did this twice, once British and once German initiative, but both times I had to shut down the app. I use an iPod 5 on iOS 8. Think this is due to assigning incorrect payloads to aircraft. Did this occur when Courageous tried to ready, launch or attack with aircraft? Courageous had launched Barracudas the previous turn and so I presume that, in turn 3, she would have attacked me. Aircraft depth charges only explode at periscope and shallow depth. They no longer sink to the depth of the submarine if the submarine is at deep or very deep depths. I witnessed HMS Ajax explode at the start of a battle in BoTA. Playing as Germany, the British ships started their turn first. HMS Ajax fired first. Then the two British destroyers put up smoke. While the British destroyers laid smoke, HMS Ajax exploded and sank. It was undamaged, and I hadn’t even fired yet. The manual probably will need an update in the near future. I had a German torpedo bomber drop 2 torpedoes in BoTA at once. The torpedoes glitched, and they ran forever. When you use German torpedo bombers, they can start out very far away from the target(s). This generally happens when there are a lot of submarines in custom battle and BoTA battles. If you target the enemy ship, adjust for the ship’s movement, and launch a strike, if there is a submarine in the generally path of your plane, you will generally start out far from the target. This occurs when you play as Germany. This has been bothering me for awhile. Why is does the Scharnhorst-class battleship have an 18 inch maximum belt armor thickness on a 31,000 ton hull? This number seems high compared to the data I’ve read. It is a 14 inch belt plus a 4 inch turtleback. HMS Ajax: was she damaged in a previous encounter? She may have spawned with heavy flooding and once the physics caught up with this, she sank. Torpedo bomber: yours or the enemy that launched 2 torpedoes? HMS Ajax was completely undamaged. She had not been damaged in a previous encounter. It was the first time I encountered it. My torpedo bombers launched 2 torpedoes. Yes, please add early US BBs. They actually provide quite a bit of balance to BofA. Maybe German E and S boats to help balance out German capabilities as well? Possibly the pre-dreadnaughts the Germans used?